Fans of Marie Kondo and the decluttering trend will love the concept of a Project Pan, especially if you want to streamline your makeup collection and stop wasting money on products that you never use. 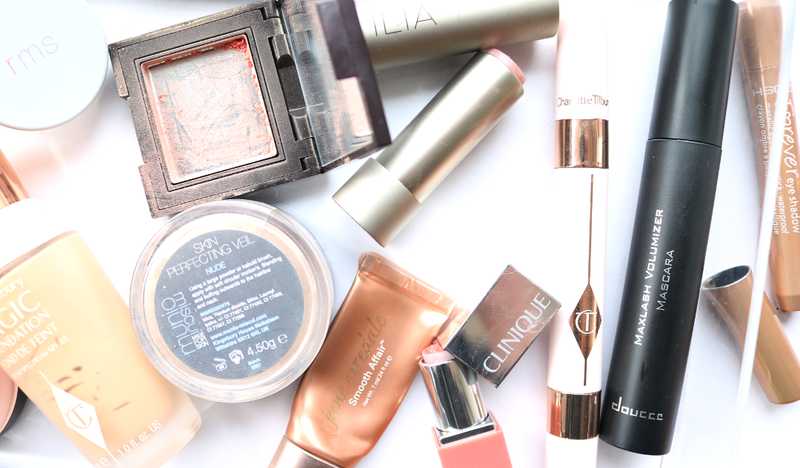 I've been a keen Project Panner for a long time now and although it might sound strange, I find it hugely satisfying to use up a makeup product. Similar to my popular monthly Empties posts that contain skincare and bodycare items that I've finished off, I've been saving my make-up empties for these six-month Project Pan posts to keep track of what I've been using up. If you haven't heard of a Project Pan before, it's basically where you choose a number of makeup products from your collection to completely use up, and often, many Project Panners will tie this in with doing a No Buy challenge (e.g they won't buy any more mascara until their opened ones are finished off first). 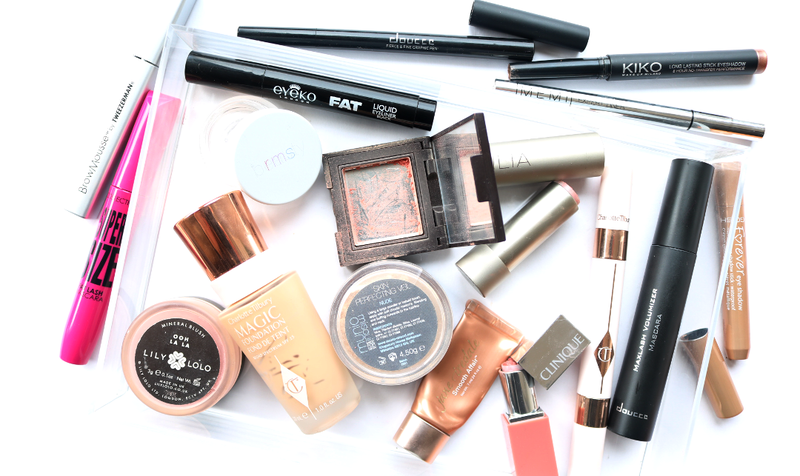 It's a great way to save money, clear out any old or expired products (I generally do this before choosing my products), and rediscover some old makeup favourites that you may have pushed to the back of the drawer and forgotten about. So! Here are the results are my latest six-month Project Pan if you're curious to find out what I've been mainly using recently and whether I would repurchase any of them again. I initially chose 20 products as my target, but fell a little short of the mark and finished up 17 instead - but that's still pretty good going for me! My brows have a mind of their own if I don't tame them with something and I've used Tweezerman's Browmousse in the past with good results. Another one arrived via a beauty box and I like it because it doesn't flake or go crunchy throughout the day. Repurchase? There are cheaper, similar products out there so probably not. Another beauty box find but one that was totally rubbish to be frank! It gave me panda eyes within an hour of wearing it and dried out quickly too. Repurchase? Nope! It's incredibly rare that I repurchase blushers because they take an eternity to use up, but I loved this one so much that I immediately bought it again when I lost the original on holiday. Ooh La La is a gorgeous everyday pink that instantly makes my complexion look healthier and more awake. It's only taken me about three years to finish this one up! Repurchase? I'm sure I will at some point. 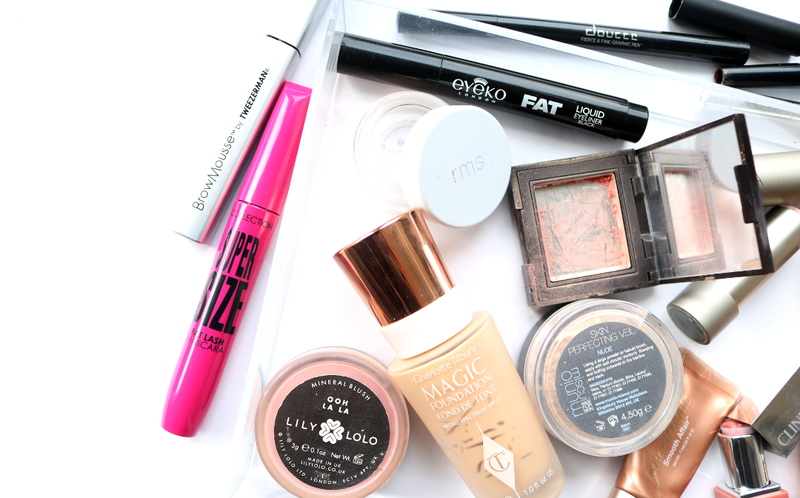 Whilst I adore Eyeko's Black Magic Liquid Eyeliner, this Fat one was really disappointing. The nib is just way too chunky to work with IMO, although it does have great pigmentation and staying power. Repurchase? Not for me. Featured in a previous Project Pan here, this multi-purpose foundation and concealer is a firm favourite of mine and I can imagine that I'll always have one of these in my makeup collection. My shade is 22 which is a perfect match for my skin tone and I just love the light-medium, buildable coverage that it offers. Repurchase? Yes. Argh, this is one of those annoying liquid eyeliners which is amazing in every possible way (staying power, pigmentation, ultra-fine skinny nib for precise flicks etc), but it dried up within a month of opening it! Repurchase? No. If someone asked me today to pick a holy grail liquid foundation, it would be Charlotte Tilbury's Magic Foundation without a doubt. It covers all of my imperfections but doesn't make me feel or look like I'm wearing a thick mask. Worth every penny, though the bottle is a nightmare to get the last remnants out of. Repurchase? Yes. I was very kindly given another one of these beauties at a blogger event last year and it's been my go-to setting powder ever since. Super finely milled, it's talc and preservatives free and gives the most natural looking 'my skin but better' finish. Repurchase? Yes. One of my favourite primers, Jane Iredale's Smooth Affair goes on like silk and provides a lovely base for makeup, whilst also making your skin look brighter and more glowy. Many supermodels use it as a hangover/long flight pick me up and I can see why! Repurchase? Definitely want to buy the full-size. For the ultimate low maintenance, throw it in your handbag and re-apply without a mirror lip product, you can't go wrong with the Ilia Tinted Lip Conditioners. Nobody's Baby is their everyday neutral pink shade and I'm pretty sure this is the second or third tube that I've gone through. It's very moisturising and has a lovely glossy finish. Repurchase? Yes. This lippie from Clinique is sort of similar to Nobody's Baby, but it offers more colour and is more of a standard satin lipstick finish. I liked it a lot, however I did find that it dried out my lips every now and then. Repurchase? Probably not. I find cream eyeshadow sticks so easy to use as you can simply swipe them on, blend with your fingers and you're good to go, so I reached for this quite often on a day-to-day basis when I was in a rush in the morning. 06 is a great shimmery bronzey/taupe shade that accentuates dark brown eyes beautifully. Repurchase? Yes. I'm not having much luck with liquid eyeliners lately - this is very similar to the Doucce one above as it performed so well and was really easy to use, but again, I found that it dried up too quickly for my liking (and I always make sure the lids are on properly - how disappointing!). Repurchase? No. This is Charlotte's answer to the Touche Eclat and it features a double ended tip with a brightening concealer on one side and an eye cream on the other. I LOVE the concealer end but the eye cream side proved to be too heavy, greasy and rich for my skin which is a such a shame because it puts me off buying it again as I loathe wasting product. Repurchase? No, but I'll try out her other concealers instead. 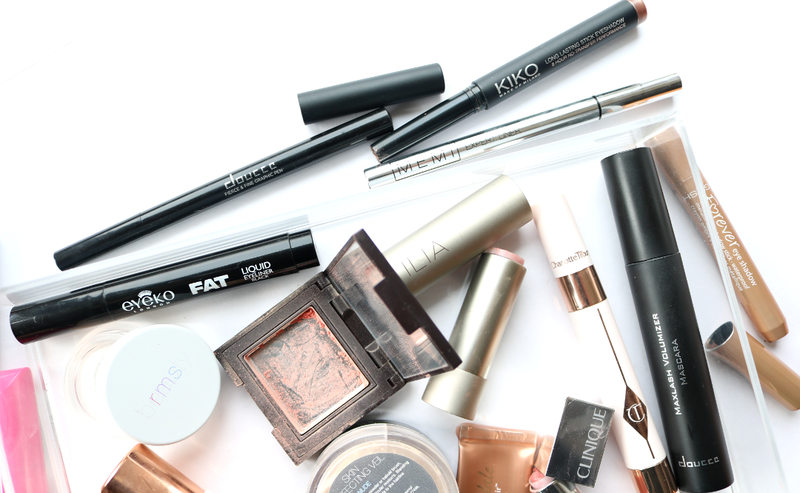 I was very impressed with this mascara - it gave me massive, wide awake lashes and definitely helped to lengthen, thicken and define them so it's a great all-rounder! Repurchase? Yes. GOSH are a hugely underrated makeup brand IMO and their eyeshadow sticks are comparable with the KIKO ones above in terms of price and performance. They glide on easily and stay put all day, what more could you ask for? This shade 03 Light Copper is brilliant for brightening up the waterline or simply adding a glossy sheen of coppery gold all over the lids. Repurchase? Yes. Have you ever done a Project Pan? Have you tried any of the products that I used up?